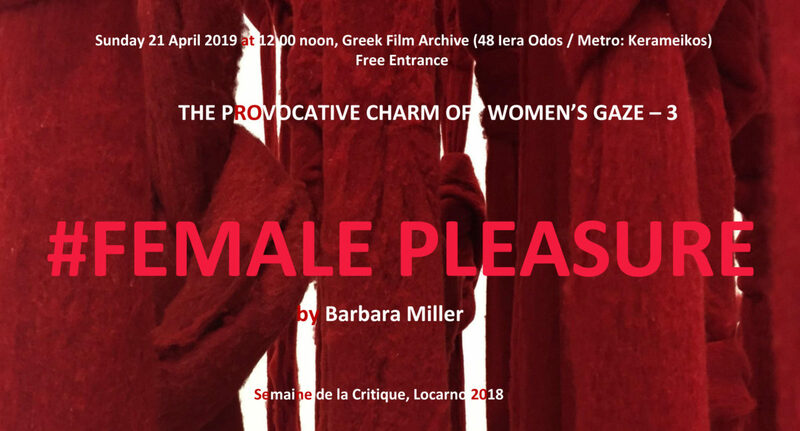 WIFT GR invites you to the next installment of its screening series THE PROVOCATIVE CHARM OF WOMEN’S GAZE: The award-winning documentary #FEMALE PLEASURE by Barbara Miller will be screened on Sunday 21 April 2019 at 12:00 noon, in the Greek Film Archive (48 Iera Odos & Megalou Alexandrou Str., Athens, Greece / Metro: Kerameikos). An open discussion with the audience will follow, led by our members Antoinetta Angelidi (film director) and Rea Walldén (film theorist). Free entrance. Barbara Miller’s #FEMALE PLEASURE portrays five courageous, smart and self-determined women, breaking the silence imposed by their patriarchic societies and religious communities. With incredible strength and positive energy, Deborah Feldman, Leyla Hussein, Rokudenashiko, Doris Wagner and Vithika Yadav are fighting for sexual liberation and autonomy for women, beyond borders, religious rules and cultural barriers. And they win. But their victory comes at a high price: they all have experienced public defamation, threats and prosecutions, and excommunication by the societies in which they grew up. #FEMALE PLEASURE shows the mechanisms at work that determine the position of women until today, spanning cultures, religions and continents: from Japan and India and the Somali Muslim diaspora to the Hasidic community in Brooklyn and the Catholic clergy in Europe. These women decided to speak up and fight back. Their courage and strength constitute a live inspiration of resistance and a reminder of the fact that societal structures can change. #FEMALE PLEASURE closes the WIFT GR screening series THE PROVOCATIVE CHARM OF WOMEN’S GAZE, for the year 2018-19. We show films made by women, offering subversive points of view and unconventional perceptions of gender. After each screening, an open discussion follows, led by members of WIFT GR. Come to watch films with us, with thought and pleasure! Come to share questions and experiences!